Just read your new post. Interesting article about graves stones in Japan. I am presently in the “Big Bend Nat’l Park” with my son, Marlon Rison. We are here with 22 other friends that I worked with back in south Texas (Victoria). We make this trip almost every year. Occasionally we skip a year. It is a thoroughly refreshing place to visit, peaceful, quiet, animals, hikes, etc. Spectacular views! A park person mentioned last night that the park is the least visited but many visitors are repeat visitors, that includes us! I have visited the park somewhere between 15 and 20 times since 1984. Will send photos later. The AGS group has some interesting things that can probably help us at Love cemetery. In Nacogdoches, we have access to the professors there at Stephen F. Austin that get involved with the community. They held a headstone cleaning seminar a few years ago at one of my family’s cemeteries (Sand Hill) It was very helpful. More later. About to go hiking. Good to hear from you, thanks for letting me know you’re there with your son. Have you ever seen that green flash of light there on the desert at sunset? The only time I’ve ever seen it was there in Big Bend. I don’t recall the name for it, but it’s an actual phenomena that occurs in the atmosphere under certain conditions. Big Bend is a beloved, well-known favorite place of mine. You’ve just touched a vein of memories. I’ve hiked in Big Bend, floated the river… I used to be a river guide. My grandfather used to hunt deer in the Davis Mountains. I ran the first adult women’s Outward Bound course there on the Rio Grande in the early 1970’s, a week-long course adaptation of Outward Bound’s then-standard 3-week course for girls. I also took a group from the Dallas City Managers office down the Rio Grande when I was Assistant to the City Manager. When my youngest son Ben was 4 years old, we visited Big Bend National Park and he did his first rock climb on a boulder there. I remember that moment of lifting him up so clearly, of raising him off the ground just enough that I could then place one of his feet on a foothold so that he could begin to experience the world vertically, then helping him find a handhold and find his balance. He took off! Before I knew it he was “walking” up that rock with a foothold here and hand-hold there, he was a natural. Ben now has two boys of his own. 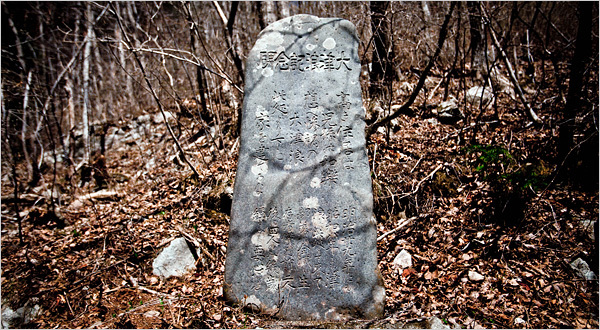 I don’t know how to articulate what I see in these “warning stones,” these messages from the Ancestors from Fukashima, but I kept this photo knowing that I wanted to come back to this image and consider it more deeply. The shape of the stone is striking, like a headstone only it marks the future, not only the past. The stone sits at the high water mark of a centuries-old tsunami. The words carved across its face tell people to build their houses only above this marker. Below the stone, the tsunami will devour you. Those are my words, Archie, paraphrasing the warnings carved into several different marker stones or message stones that were found after the 2011 earthquake and tsunami at Fukashima. Ages past could not have predicted the nuclear disaster at Fukashima that followed the tsunami and that is still unfolding. These warning stones are messages from the ancestors, they’re an inter-generational story that’s being told. The headstones at Love Cemetery, the African Burial Ground National Monument in New York, and at Sand Hill, and all the cemeteries that you and I know about are not “warning stones” — about a particular kind of natural disaster that happens in any given area — like the Japanese stones that mark the reach of the tsunamis – but still, there may be a fruitful parallel to be found. Or not. Perhaps it’s enough to strike or chord or set off a resonance and trust, trust that for whatever reason, someone else will be touched.